RDCK commit to 100% renewable energy by 2050!! Breaking News! Another green triumph for the Kootenays as the RDCK commit to 100% renewable energy by 2050! We are thrilled to announce that the RDCK has recently passed a resolution that commits to deriving 100% of its net energy from renewable sources by 2050. In fact, they haven’t just made the commitment to the goal, they’ve also committed to implement projects and develop strategies to get there. The last few months have seen both the Village of Slocan and the City of Nelson sign on to the 100% renewable Kootenays initiative, and with this latest success, momentum in the region is gaining steam. The RDCK commitment also makes logical sense; with the RDCK on-board, we can progress with region-wide policies and initiatives that will tie all communities together and offer the best in collaboration and cooperation. What’s more, looking forward to a transition off fossil fuels will require a transformation in the way we source much of our energy and how we travel, a lot of which will fall under the RDCK’s jurisdiction. It’s clear that we will need to find regional, zero-carbon solutions to transportation which will require municipalities and the RDCK to work together. According to our Renewable Energy Scenario, we will need to reduce our regional energy consumption by approximately 34%, but we will still need to source 1.675 TWh (terawatt hours) of renewable energy. While it is too soon to know the exact details of this energy mix, we know it will need to be diverse, and will require land that falls under RDCK jurisdiction. Having the RDCK commit to this target and begin to strategically move forward now is precisely what we need to bring about a cohesive regional transition. 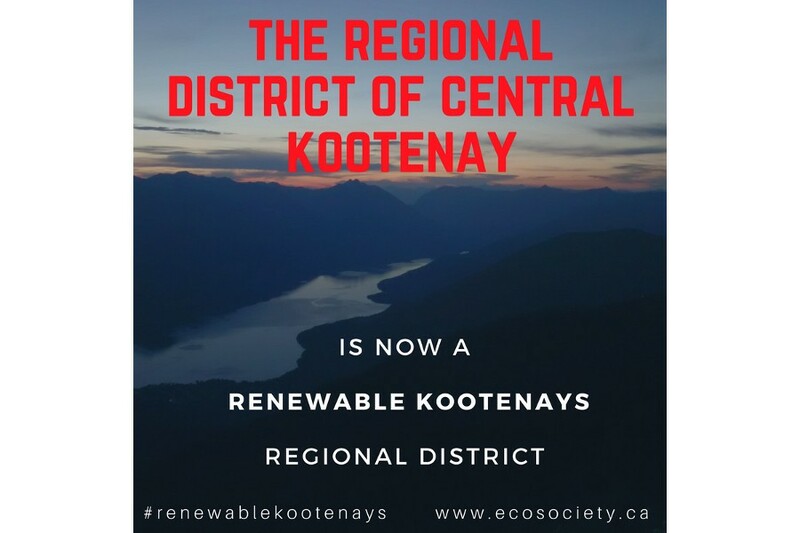 “Support for a 100% renewable energy future is growing, and we look forward to working closely with the RDCK board, as we also continue to encourage individual municipalities across the region to join us,” said Nicole Charlwood, co-Executive Director of West Kootenay EcoSociety. We look forward to working with the RDCK and other 100% renewable Kootenays communities as we take these next steps together! Do you want the West Kootenays to transition onto 100% renewable energy by 2050? We need your help! Commitments are an important first step, but we need support to make promises turn into action.